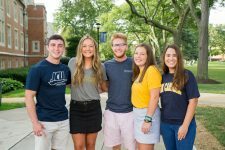 There are a number of hotels located within five miles of John Carroll’s campus and conveniently situated near area shopping and dining establishments. While John Carroll University does not endorse any particular hotel chain or property, we do encourage you to stay at one of our preferred vendor hotels identified below. To secure the special JCU rate, please contact the hotel directly. Rest in comfort at the Fairfield Inn & Suites Cleveland Beachwood. Each room comes equipped with 32” LCD flat screen televisions, complimentary wireless high speed Internet access, and plush pillow-top beds. Enjoy a complimentary hot deluxe breakfast buffet, fitness center, and pool. JCU rate: $95/night includes breakfast, complimentary parking and Wi-Fi. The following is a list of other nearby hotels where you may choose to stay during a visit to John Carroll University.